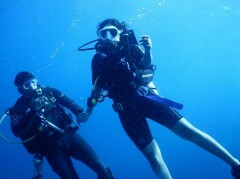 The couple that dives together stays together! 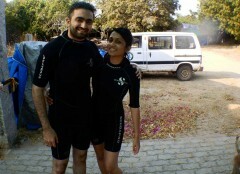 This private scuba experience in Pondicherry lets you go out with your partner (and your instructor, of course!) to explore the magical underwater world on your own. You'll have a theory session and practise basic skills in a tub/pool, before you head out to a dive site where you'll enjoy a 45 minute Discover Scuba Dive (DSD). You'll end the the trip with a private cruise, where you'll be served champagne with strawberries and cake as you watch the sun melt into the blue waters. This package also includes underwater photographs of you and your partner, so be sure to bring a USB or hard drive to take them home. This private scuba trip is perfect for couples who love adventure. You don't need to know how to swim for this Discover Scuba Dive in Pondicherry. Pondicherry is a popular scuba diving spot in India. The underwater world here is richly diverse, with colourful fish like the lion fish, the angel fish, the parrot fish, as well as sting rays and eels. The scuba diving spots are about 3-15 kms from the harbour, and with average temperatures of about 28 degrees Celsius, and visibility as far as 30 metres on good days, this is a perfect location for a tropical scuba diving experience. You'll sail back just as the sun begins to set, after a day of fun and adventure in the sun. • Book a private Discover Scuba Diving session with your partner. • Head out on your very own boat with your own crew, into the blue waters of Pondicherry. • Explore brightly coloured fish and coral as you dive to 12 metres or 40 feet. • Enjoy your private sunset cruise with your partner, with a glass of chilled champagne, strawberries, and cake. 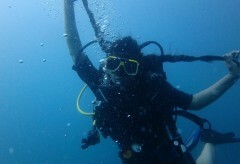 • Take home free photographs of your Discover Scuba Dive in Pondicherry. 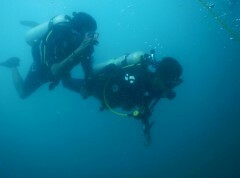 Smoking, consumption of drugs or alcohol is strictly prohibited before and during the scuba diving trip in Pondicherry. The champagne will only be served after all diving is completed. Participants must adhere to the intructions of the instructor at all times during the Discover Scuba Dive in Pondicherry. Participants must be present at the dive centre at 08:00 hours for the theory session. It is not recommended that you catch a flight within 12 hours of your last dive. Do plan your travel itinerary accordingly. For cancellations made 30 days or more before the Discover Scuba Dive in Pondicherry: Full refund will be given, minus any transaction charges. For cancellations made 29-14 days before the Discover Scuba Dive in Pondicherry: 75% of the total trip cost will be refunded, minus any transaction charges. For cancellations made 13-8 days before the Discover Scuba Dive in Pondicherry: 50% of your total trip cost will be refunded, minus any transaction charges. For cancellations made 1-7 days before the Discover Scuba Dive in Pondicherry: No refunds will be given, but you can choose to reschedule your date (subject to availability). On the day of the program if after the pool session, you are unable to perform the necessary skills comfortably, then you'll be only charged for the theory and intro session, pool session, certification and booklet. If the operator cancels the dive session due to unforeseen circumstances such as logistic issues, weather conditions, etc., you can choose to reschedule your dive at any available date, dive at the freshwater quarry instead and avail a discount of INR 1500, or get a full refund. The operator can conduct and teach the course in English, Tamil, Hindi, Bengali, French, German, Dutch, Spanish, Danish, Hebrew, Malayalam, Kannada and Manipuri. If you want to share this trip with another couple, the additional cost per person is INR 7900. You'll have to eat a hearty breakfast and report to the dive centre by 08:00 hours. You'll meet your instructor and begin a private Discover Scuba Dive theory session, followed by a trial in the pool on site. You'll take a break for lunch (you can pop out and grab something to eat), and then, when you're ready, you'll set off in a private boat to the dive site. This is where you'll gear up and dive into the first scuba dive of your life, accompanied by your partner and your instructor. When the dive is over, you'll clamber aboard again, where a glass of chilled champagne is waiting for you, along with strawberries and cake. You and your partner will watch the sun setting over the coast as you head back to shore, making this the perfect romantic adventure. At the dive centre, you'll be given your DSD certification and the photographs of your trip. Trip ends here. • Please carry specific personal or prescribed medication, personal first aid kit. Your dive centre is a 5-minute walk away from Pondicherry Railway Station or a 12-minute walk from the sea front. The dive centre address is: 9, A. Gandhi Road, Opposite Indira Gandhi Stadium Pondicherry 605001.